They're running....er....sleeping with the big dogs now. These guys (like the two Virginians sleeping soundly on the hardwood) have weight pulling titles. That means they work themselves up to some SERIOUS slumber. And their dear little Stormy could multi-task: Bathe and sleep at the same time. 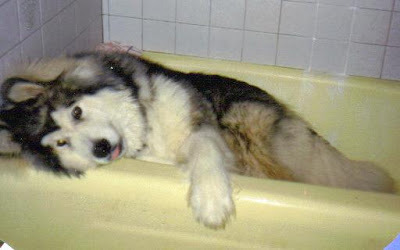 Hey, who hasn't fallen asleep in the bathtub? How can Breeze and Ariel hope to compete with such well-rounded somnathletes?! So, here's a tandem snooze for the record books. Wake 'em at your peril -- They're likely to lick you in revenge. And there's nothing quite so slobbery as a face lick done in revenge. I pity the poor Olympic judges who have to decide this contest. It looks like we have a SERIOUS contender for the title in this first venture into Olympic Synchronized Sleeping. 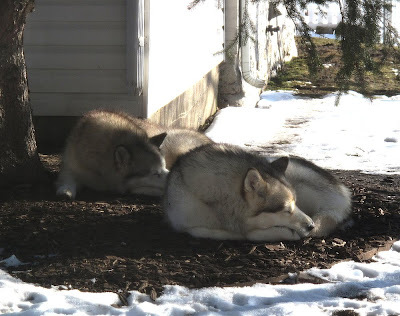 From Winter Park Kennels (in Virginia, no less!) 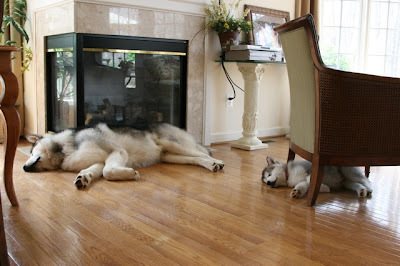 Bruin and Ava asleep in perfect synchronization. We may have a winner, but the judges are still in conference. The question has arisen...."Isn't it cheating to use too-cute puppies?" Team Wildwood…. now ties the American Team, Breeze & Ariel, with a solid “9” for touching while sleeping …. The team from Wildwood Kennels performs an almost unheard of, unbelievable, perfect "BOOKENZ"! Just in time for the Winter Olympics -- a new event! 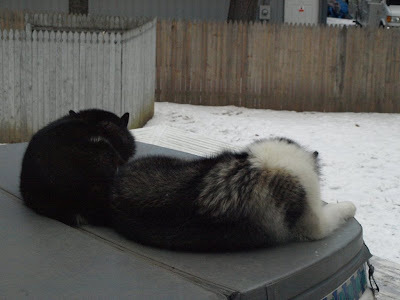 Sadly, the judges had to note a manditory deduction of 1 point for the non-matching front right paw. But the Americans still lead with a solid "9"! In an interview following the event, Breeze said "I and Ariel may just be the totally greatest synchronized sleeping team in, like, the history of the event and stuff." I didn't respond. 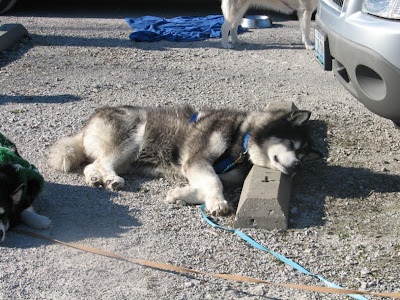 It's common wisdom to let sleeping dogs lie. 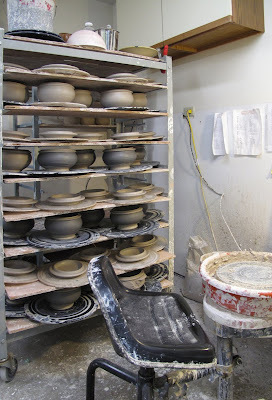 For the first several years of my pottery, I operated pretty much as an island unto myself. I had very little education in clay, and I didn’t subscribe to the publications that I could have. I was mostly just trying to make a living. And sadly (I must admit), since I’d chosen this path of isolation I was destined to spend an inordinate amount of my time “re-inventing the wheel”. So I was pretty well preoccupied. But the one constant from my early years until now is that I’ve always decorated with slip – brushing, dipping, trailing, stenciling, masking – everything slip. Well, my self-imposed isolation, coupled to my use of slip, had me thinking naively that I’d actually “invented” feathering. I hadn’t seen it done. I’d figured out the technique by simple trial-and-error. Thus, I concluded it was just something I’d “come up with”. Then one day a friend from Bryan, Ohio took me to dinner at Sauder’s Restaurant in nearby Archbold, Ohio. 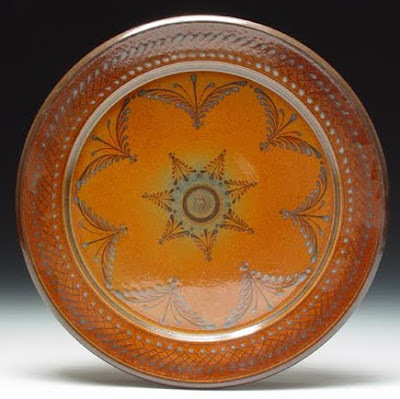 Imagine my surprise -- as the inventor of slip-feathering – to be looking at a table set with pottery decorated pretty much as it would, had it come from my shop. The cream and sugar set at the table was a pair produced by Mark Nafziger. And those pieces had feathered slip decoration banding their circumference. 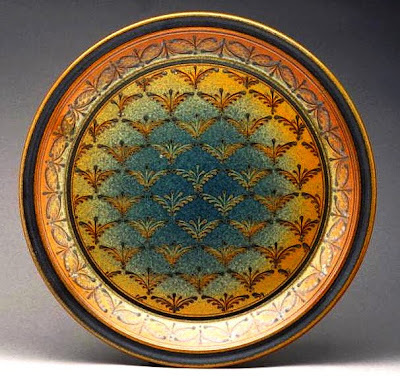 By the time I finally did acquaint myself with Mark he was doing some of the finest pottery, decorated with THE finest slip work imaginable. Mark is a craftsman of the highest order. He does so many clay things well. And his decoration is so breathtaking that it might be easy to overlook some attention to other details Mark puts into his work. Shape is an interesting thing. It’s relatively easy to come up with a strong thrown form by sort of “letting your yea be yea and your nay be nay” (to quote the Good Book). That is, it’s easy to make strong forms if you’ll sort of divide the piece into its natural anatomical parts and then make each of those parts fit very committed silhouettes -- arcs, straights, cones, etc, and then watch for pleasing proportions. Mark’s been much published. It seems most of what people say about him ends up coming back around to discussing the precision of his work – and that usually written with some mention of his math background (The other part of his academic training). That precision is noteworthy, praiseworthy, and (as Breeze would say) “stuff”. To me, what’s more amazing about that precision, though, is not the implied difficulty of execution. Yes, I can certainly appreciate that. No, to me what’s remarkable is that in the final analysis, Mark’s work has become animated by that tight control to such an extent that the process has itself become transparent. The decoration serves the piece’s unified whole rather than merely calling attention to itself as a “show”. But even after all of those considerations, it was a very simple thing about Mark’s work that so strongly influenced me. 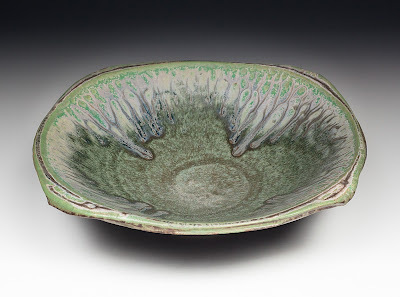 Mark and I both make shallow bowls – bowls so shallow that essentially the backside is more like that of a plate than a bowl. And as such, I hadn’t really considered decorating what is, for all practical purposes, not seen – the back of the bowl. I’ve decorated the back of my bowls ever since. Oh, I’ve got a few decorating techniques that literally don’t allow me to do much decorating there – but even then I always try to figure out some means of expressing myself on the back sides of my shallow bowls. Each morning for our run (when weather doesn't permit running on the trails), Dar leaves with Ariel and I with Breeze at two different times. Breeze and I always finish -- return home -- before Dar and Ariel. When we get home, Breeze circles around the yard until he tracks Ariel to the gate. Thus satisfied that he knows where mom and Ariel went, he sits like a statue waiting for them until they get home. 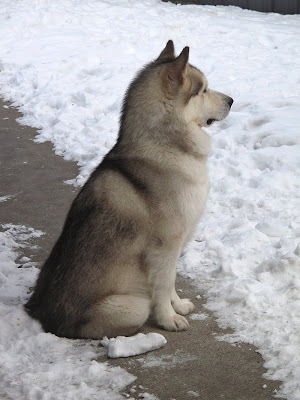 He hardly moves a muscle from this sitting position -- maybe just the flick of an ear that lets you know he's listening for them as intently as he's watching. And he'll sit watching for them like this for well over fifteen minutes at a time. I had a terrific Saturday. 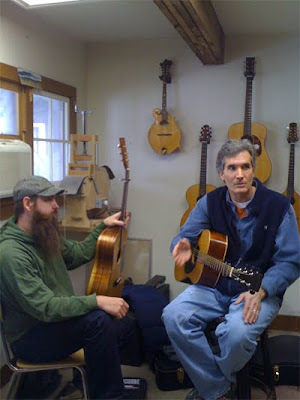 One of my favorite places in the world to hang out is in "Wooden Music" -- Jim Shenk's guitar shop in Goshen Indiana. Wooden Music has the strongest musigravitational-pull-per-mass ratio of any music store in the universe. I honestly don't know how Jim gets any work done because every musician for fifty miles is drawn to hanging out there as strongly as I am. And the shop space is not big. He works out of a space that was once the back lot of a lumber yard, now divided and finished into small shops like Jim's. 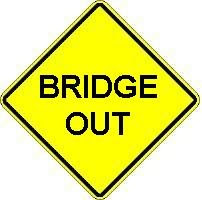 And Jim is busier than he knows what to do with -- he is THE go-to guy for repairs in Northern Indiana. That's one of the fun things about popping into Jim's shop. You'll almost always see the most incredible instruments -- rare and expensive, or strange, much-loved "heirloom" cheapies that folks care for beyond all financial reason. 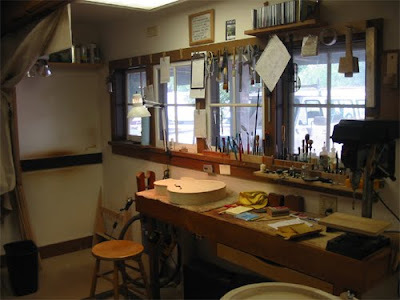 And Jim builds and repairs all fretted instruments, so you're as likely to see a bouzouki as a banjo being worked on on his bench. Yesterday tipped to the "rare and expensive" side of that equation. There's a group of jazz players who have started to hang around Wooden Music in the past five years. 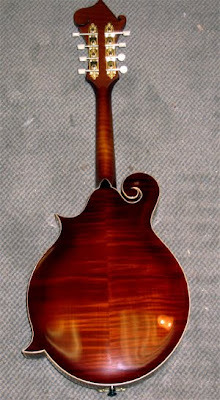 This came about as Jim started building really fine archtop guitars a while back (after a lengthy time on his lap, Benedetto declared one of Jim's archtops, "very fine"). 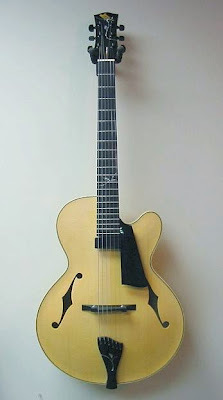 Yesterday three of those jazz players showed up to look at a new/used Solomon archtop one of the fellows had just brought up from Gruhn's. Time was slipping by for me to get over to the morning's old-timey jam, so I left the jazz players behind at Jim's and went off to play fiddle tunes with old farts. The old-timey group that gets together twice a month is very uneven, skill-wise. But that's one of the pleasures of playing with them. Everyone is trying to learn something -- whether the tune, keeping steady rhythm, intonation on their fiddles -- always learning something. 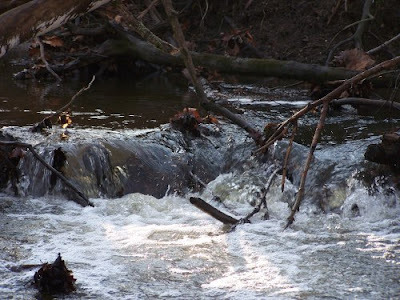 And so they're pretty forgiving of me and my decidedly NOT old-timey guitar: I play minor chords, I mix up straight chords with swing chords on occasion, and I often lead off the tunes with guitar -- something not done in fiddle sessions. 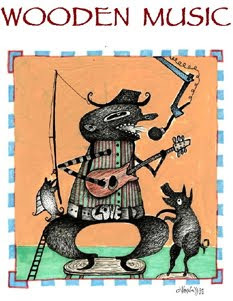 But one reason I often lead off on tunes is that, depending on the mix of players, the sessions too often degrade into too much jawin' and too little pickin'. So I am inclined to start a new tune almost as soon as the cacophany of the previous tune stops reverberating down the hall. I don't go up there to talk. I go up there to play. Okay, I go up there to talk a little too. Yesterday's session was what I consider one of the better ones. We had moments of real music, I was pretty clean with the tunes I led out on, and I was able to pick up on the tunes I wasn't familiar with. Besides the mando repair, I also still held out hope that some of Jim's other shop "regulars" would show up. Those impromptu jams in Jim's shop are the joy of my musical life. And I wasn't disappointed. Within minutes, Jim's playing partner, Duane, showed up. Exactly who I hoped would stop by 'cause when Duane and I had last met, we discussed how much we both love the music of Danny O'Keefe, and his song "The Road". Well, that conversation had prompted me to relearn that old gem, and this would be the first time I'd be able to show Duane what I'd come up with. ...and joining me in "The L&N Don't Stop Here Anymore" and "Ready For The Times To Get Better" and "Windy and Warm" and "Crazy World" and a half dozen other songs. 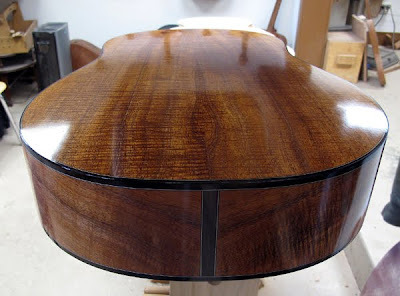 I mentioned that getting a glimpse of the older instruments that Jim repairs is one of the pleasures of a stop in the shop. 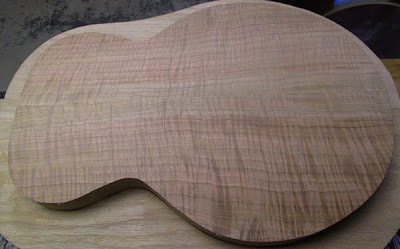 The other pleasure is in seeing the many instruments in all stages of completion -- partially completed necks, backs, sides, unused top and back sets to imagine into guitars and mandolins. And the smells -- I love the smell of cut wood. Cherry sweet. Walnut coffee-bitter. 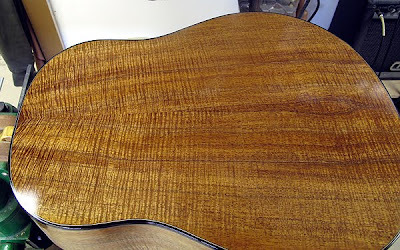 Mahogany rich. Just walking into the shop is a treat for the senses -- sight, sound, and smell. All in all, as good a Saturday as a guitar-crazed fella could ask for. Ann Nonymous asked me if I would post a short video showing how I do the vine/handles on my pumpkins. Well, as it happens, I'm in the midst of catching up on pumpkin things. Breeze says that this is nowhere near as exciting as yet another dog blog, but he understands the need to talk pottery from time to time. So here's a short from this morning's handling. picture added just because blog posts should have pictures! 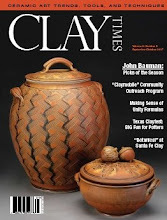 Yesterday I posted my letter to the editor that is currently published in the February issue of Ceramics Monthly. When I submitted that letter, I was painfully aware of how long-winded it had become. "Painfully" because I had first written the entire lengthy tome out longhand on a paper bag while standing behind my counter at the Columbus, Ohio Winterfair. And since I knew there was a fairly good chance that the letter wouldn't get published anyway -- being as long as it was -- I didn't want to further undermine the time already spent on it by submitting an even longer letter. 1. The "Nafziger Phenomenon". 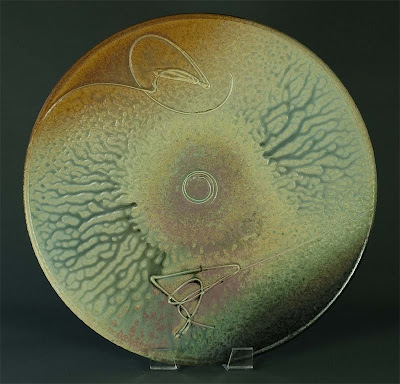 Mark Nafziger is internationally known for his intricate slip-trailed patterns on a graded rutile-blue glaze background. Mark tells the story on himself: The first time he created that background on which his trailing visually "popped", he saw it as a flaw. It was on a bowl and as he took the bowl from the kiln, in disgust he laid it aside. Months of shop junk piled up on it until one day his wife happened into the shop. She picked up the pile of indiscriminate junk -- helping Mark straighten things up a bit -- only to find the bowl hidden beneath. She remarked how absolutely stunning it was (she was right). 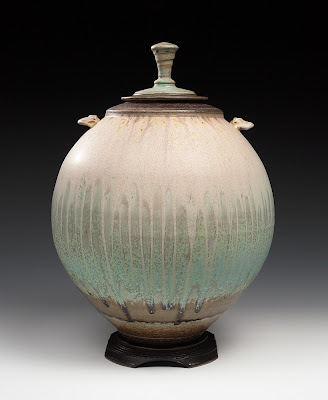 Mark's eyes were open, and the rest is ceramic recent history (within a year, Mark's pots graced most of the ceramic publications in the country). In other words, when your eyes are blinded by how far you missed the mark of what you intended, you may be missing the fact that you just came up with something even better than you intended. 2. The Fear Of Breaking New Ground. 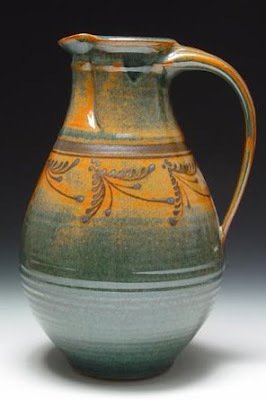 If you have to wait until you have perfected a piece before it becomes viable to your studio, you are far more likely to stick to the tried and true and not experiment -- not "grow" as a potter. But if you can adopt a more realistic view of the developmental steps as more viable, you're far more likely to try something new. I understand what Conner Burns is talking about. Really, I do. I want to always be putting my best foot forward -- quality-wise. But it appears, from my perspective as a functional potter who has made his entire living for the last thirty years from making and selling pottery, that Mr. Burns lives in a different reality from mine. Maybe his reality is a better one than mine, but it is surely different. The "hundred years down the road" question was one of the key points of departure for me. Mr. Burns' perspective on it seems to ignore the way we currently view the past 6,000 years of ceramic history. 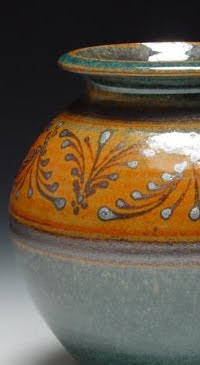 There is a great understanding of the many process-related difficulties inherent in clay throughout its history that I doubt that anyone would draw many conclusions about the level of perfection put out by a particular potter based on such process-related problems. Even so, still, what we consider perfect or imperfect will likely have little meaning to the world one hundred years from now. Add aesthetic considerations to those process-related considerations, and I'm guessing there will really be next to no point of reference one hundred years from now. But if Mr. Burns is right, then when I thus consider the view others might have of me and my pottery one hundred years from now, all I can say is "whoops." I never had the luxury of putting out only the pots I was most proud of. I've been making my living as a potter since I was a college kid. By the time I was even 25 years old there were literally thousands of pots in circulation with my name on them. 15,000. That’s my guess. Most, if not all of them were pieces that would cause me a pretty good cringe if I were to see them today. If I wanted my name to go down in history conjoined to notions of perfection, that ship sailed about 35,000 pots ago. 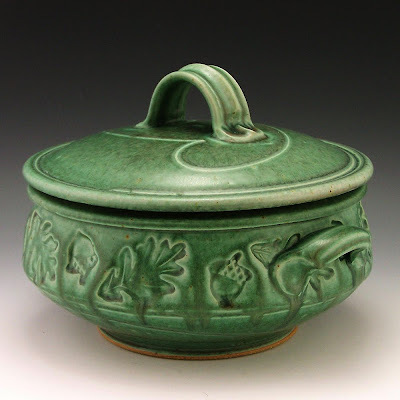 But the funny thing about that progression -- and I think it's a universal among potters -- I was proud enough of my pots all along that I was at least self-assured that I was giving the people who bought them the value that they were expecting in the transaction. I didn't at any time think I was selling anything less than my best. But the judgments I made back then had a different basis. Less experience. If the twenty-five year old me were to write something like what Mr. Burns wrote -- about not letting go of his less-than-perfect work (And I could have written something like that back then. I did feel that way), I would look at that bit of writing with quite probably more embarrassment at my precocious hubris in the claims I'd have made in that writing, than any embarrassment I might feel at my less mature pots in the same retrospect. 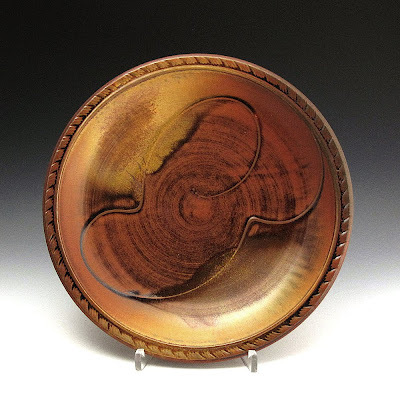 So making probable landfill allowed me to advance my craft so that eventually time and trial & error overcame my insufficient education, and I actually made a pot or two that I was thrilled to stand behind at my art fair booth. Maybe it's different for artists who pop into this world with a full-blown vision of their creative goal -- coupled immediately to the skill to actualize that vision. Wow. Zounds. I'm pretty sure I’ve met those with the self-assurance that they are such prodigies. And maybe I'm too comfortable with the inevitability that I will plod along rather anonymously -- happily bounding between the joy of clay and the reality of making a living -- to such an extent that, no more known than I am today, I will be even less known 100 years from now. unschooled middle class buyers predisposed to home decorating and gift buying. Last year I went to a songwriting workshop. The leader was a fellow name Pierce Pettis whose songs -- whose writing -- I love. Mr. Pettis said something in that workshop that was so obvious that I was stunned to have not thought about it in exactly the way he framed it before. What he said is that a song never need be "finished". Oh, for the sake of recording or marketing purposes, of course an element of permanence is required and will be attached to it. But in reality, as a work, a song can be added to, improved, edited, re-framed in melody, rewritten in lyric. The possibilities are endless. 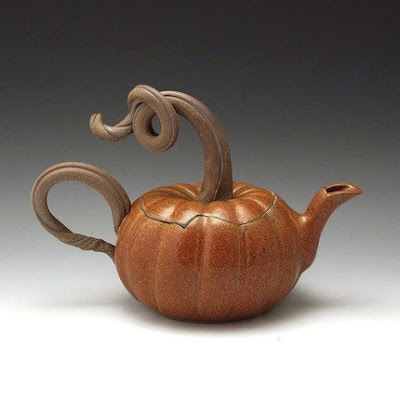 Seems to me that's how a working potter can approach clay. Pieces to market and ideas to expand on. The pieces to market aren't "perfect". They're marketable. Maybe they aren't even conceptually complete as yet. I know that the pieces I make -- that I believe to be successful enough to continue making -- still evolve. And that evolution happens as unconsciously as it does consciously. It's one of the many reasons I've chosen to remain a potter and not a manufacturer. The evolution is almost as impossible to stop as it is gratifying to witness. I hope history judges me kindly. But if I were a betting man, I'd put the big money on the probability that "history" won't be judging me at all. Maybe some working stiff will still enjoy his beer in one of my steins, though. When I was little and I saw those album covers with "LIVE!" plastered on the front, I always read "LIVE" as the verb, not the adjective. My misreading changed the meaning of the album covers enough that I couldn't figure out why the band producing the album cover was giving me the imperative -- complete with exclamation point -- to do what I was already fairly determined to do anyway. Live. 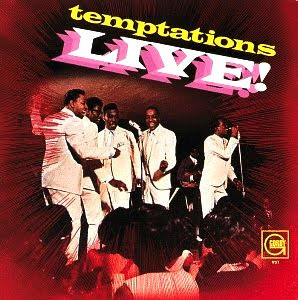 So I assumed those album covers were meant to be read "LIVE (implied: WITH GUSTO)!" ...thereby reflecting a quality of life, and not just getting by with any old life living. Boy, was I embarrassed to myself when I realized that the word echoing around in my head should have been read "LIVE!" and not "LIVE!” I blush just thinking about it. But since I never told anyone before, I mostly just blushed internally. You couldn't really tell by looking at me that I was or am blushing. I and my most excellent mom and agility handler, Dar, took me to a agility match down in Lafayette, Indiana this weekend. Agility, as I have explained in the past, is where I get to run around, over, into, and under things as my mom runs beside me getting red in the face and screaming things and stuff. ...I decided to take a bit of a mid-course break on this agility run. Since I still qualified with about 10 seconds to spare, Dar was happy with this run and stuff. Unfortunately, John Bauman stopped the camera before it could record our victorious end zone dance during which people clapped, hugged me and stuff, and gave me cheese and meat products. All in a day's work, folks. All in a day's work. As a beginner, each piece was more precious because each took an inordinately disproportionate time to create – too much effort produced not terribly spectacular results. Oh, the results were satisfying enough to at least move me on to my next attempt. 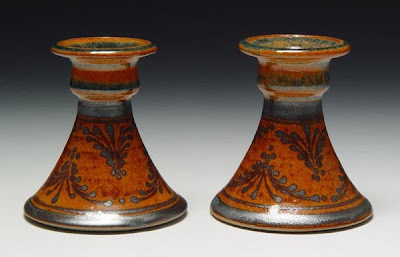 And just as the effort was disproportionate to the resulting quality, it was also disproportionate to the learning – I learned much from each early pot. 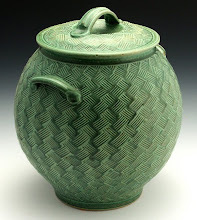 But I also needed to learn pretty quickly to get over the pots I was making and move on. That self editing started – in my mind – to take shape after one visit to the college library during which I picked up an issue of Ceramics Monthly. 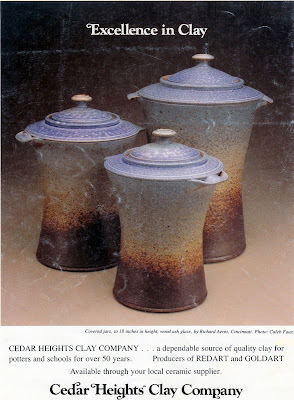 There, on the back cover, was an advertisement for Cedar Heights Clay Company featuring a glossy full-page photo of a marvelous canister set created by Richard Aerni. First, I was surrounded and supported by good and generous potter friends...Michael Frasca foremost of all, and Brenda Brown-Tarbell and Greg Siegel also noteworthy, but there were plenty more, who gave me inspiration and lots of helpful conversation. 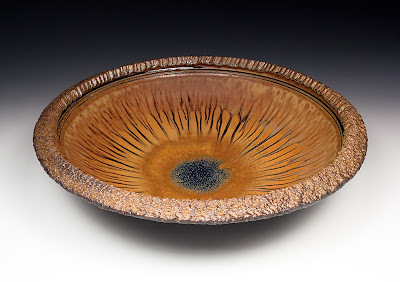 When Mike and I did the first ash glaze tests, it was love at first sight. We were starting to spray glazes and slips in the studio at that time, and that fit right in too. That cannister set was among my first ash-glazed pots, certainly in the first ten...that they came out that well was something of a miracle. Right after that article came out, I was going to Columbus to do the Winterfair Show, and thinking that now, since I was published and famous, I'd clean up. Well, you can probably imagine the ending...it was one of my worst shows ever. I ate humble pie for a long time, but kept on working. I still have bad shows, but now don't take them as personally. Thanks for the kind words. I'm glad that I was able to be of some help to you...clearly you are well down your own highly rewarding path, and I wish you the best. Hope to see you somewhere this year too!